Quads now come 200% larger! At 46" x 46" Jumbo Quads offer fewer reveals & a more custom appearance. Quads are precision CNC cut square panels with magnets on the back that attach to the MultiQuad frames to create the finished MultiQuad product. While frames provide the structure, Quads give the finished look. Quads have built-in black reveals on the edges to give a modern look and minimize the gaps and seams due to uneven trade show floors. Quads are not available without reveals. Standard Quads are 23" x 23" or Jumbo Quads at 46" x 46". Both are available for the MultiQuad Standard and MAX frames. Sometimes choosing which size Quads to use is a personal preference and sometimes it is a design decision. Jumbo Quads (46" x 46") are ideal for larger displays because they cover a larger area with fewer reveals providing a more custom appearance. But sometimes Standard Quads (23" x 23") are the preference because they give more design flexiblity for interchangeable marketing messages. Either way you go, both offer the same great convenience and ease of setup. Standard Quads include printed colors, wood grains and Velcro-receptive fabrics and dry-erase Quads. Because of the way Quads are made, there are literally thousands of available finishes. This makes it possible to get virtually any look that you want from MultiQuad. Quads can be solid colors matched to PMS colors, photos, and virtually any pattern or design that can be digitally created. If you can imagine it, it can be a Quad. Call for availability and pricing on non-standard Quads shown below. All swatch samples are for representation use only. Colors tints may vary based on monitor settings. Please request an actual proof for a accurate color match. 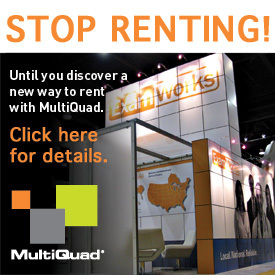 Half Quads are 12.125" x 23" and are used on the narrow side of MultiQuad Standard frames, counters and podiums. Half Quads vary from Quads in size only and all colors and finishes available for Quads are also available for half Quads. If you are using MAX frames and have a side that needs to be covered, you will need to utilize standard Quads (23" x 23") to cover the sides. Half Quads are just for Standard frames. Double Quads are 23" x 46". The double width makes them ideal for a seamless graphic surface for display your company logo or a marketing promotion. Add a backlit graphic Quad to your display to help illuminate an important message. Click here for more information and diagram. Hold up to a 22" monitor centered in a single Quad or go up to 60" when you position across four Quads. Monitors are securely attached to the frames and sit flush with the Quads for a seamless, finished appearance. Look right through your display with clear Quads. The unique design can be all clear or have a custom printed image on part of it. Write all over your Quads with the MultiQuad Dry Erase Quads. Have a handy writing tool right on your display in one Quad or create a large space for a presentation with multiple Quad next to each other. Create a hole in your display wall for show traffic to peer through. The alluring aspect of the hole will help draw visitors. A well crafted product display box gives you the ability to set your product, awards, or other items safely within your display for public view. Using our CNC Router we can cut out 3D shapes of your company logo, product name, other whatever else might be of importance to you. 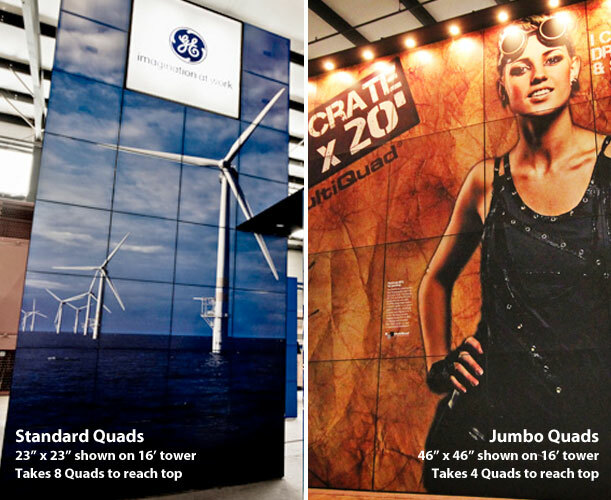 These 3D cutouts really pop from the Quads, drawing customer attention. Using Velcro® receptive fabric you still get the black reveals on your Quads. Choose any color from the Foss® or Melded Fabrics® collections. With dozens of color options you can easily attach items to your display using Velcro.